K, Kurt, tell me what you'd like to talk about this week." 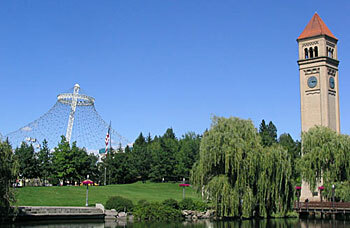 The site of the Spokane World Exposition of 1974: fruits of a fair that resurrected a town or the ghost of another failed utopian concept? "Well, doc, I've been thinking a lot about my attitude, my negative attitude. Sometimes I wonder if the negativity doesn't breed negativity." "Well, I think it's good that you're aware of this, and you may even be right. Why don't you give me an example?" "OK, for instance, we recently went north to check out some summer-stock theater. "Here, let me read some notes I took for my column:"
It's a long way to go to get good crap these days. Regardless, the trek is made to Coeur d'Alene, Idaho, for some "Footloose" tomfoolery. Should've thought twice before going to see the Carousel Players perform an ill-advised stage musical version of the popular '80s movie. Kevin Bacon wants to put a couple more degrees between himself and this performance, which has plenty of room for improvement. The director's inexperienced, the additional songs are weak. Hell, the movie wasn't that good, either  featuring pop hits that would forever change the karaoke experience (and not for the better) during egregiously long montage sequences. But tunes like "Let's Hear it for the Boy" don't come up to the knees of giantly weird original-to-the-stage-show songs like "Learning to be Silent," wherein singing moms end on a hummed duet through mouths full of cookies. "Do you need me to go on?" "No, that will do. As a therapist, I believe in openness more than most folks, although maybe if you can't say anything nice, you shouldn't say anything at all. But give me another example. So far it just sounds like you have a keen sense of critical judgment." "Thanks doc. You don't know how validated I feel just to hear you say that. But how about this: I think my negative attitude might even preempt me from enjoying things that, were I to think a bit first, might be totally innocuous. "For instance, after fleeing "Footloose," we stopped in the lovely town of Spokane to relive some formative glory. This side trip turned out sad and a bit disturbing, as it included a visit to the grounds of the Spokane World Exposition of 1974, a site which now turns the remnants of the expo into a large city park  with some carnival rides and a profusion of Hawaiian shaved-ice stands. "I'd attended the fair at the tender age of four and was traumatized by a short film called "Man Belongs to the Earth." The theme of the exposition was the environment and the movie laid out in sun-dappled blonde explicitness how we're all in deep trouble if we don't take care of the Earth. If I could go back and watch that film now it would likely seem quaint yet disturbingly prescient. "Anyway, over the years the expo grounds have changed, trees grown tall, and this afternoon it seems like no one gives a hoot about music, much less the environment. 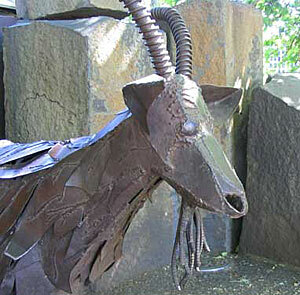 Giving a hoot: the eco-sculpture Garbage Goat. "While kids feed the cute eco-sculpture Garbage Goat, we park ourselves on a patch of sun-soaked lawn to watch the Spokane Symphony Orchestra zestfully hammer home a rousing, happy piece. "It's about 80 degrees, with gorgeous skies and geese across the way admiring the music. And there are about 10 other people listening on this wonderful day to this marvelous music. "So I'm thinking: people of Spokane, are the grounds of the fair that resurrected your town so freighted with the ghost of another failed utopian concept that you won't come near? On a beautiful day with great music to be heard for free? "And here's the rub, doc: my evil vibe makes me devalue the music, too. And so we rise quickly to check out the remains of Canada Island and to get another one of those Hawaiian shaved ices. The kicker is, it wasn't even the real performance  which started hours later. This was just a rehearsal!" "Well, Kurt, you aren't the first person who jumped to a conclusion, but you might consider 'checking yourself' in the future, in case you might miss out on something enjoyable." "And how about when I recently ventured to Portland's relatively newly minted Towne Lounge to support a friend's musical endeavors? To my credit, I was thrust into a hateful space as we walked toward the lounge because, on this night, Thirsty Thursday at PGE Park was just letting out. "Throngs of frat boys soaking with cheap beer is one thing, but when such a night is combined with the idiotic promotion of Free Loaves of Bread, it's like begging for the worst: giving the most selfish slobs in America a chance to step to the plate. We're talking about tens of thousands of slices of bread violently strewn over dozens of city blocks. Don't they know that people are starving? "Doc, I was so ashamed that I was shaking with rage as we entered the lounge and it made my feeble attempts at an open attitude die quickly. So my buddy (whose nom-de-laptop is Deep Sea Invasion) starts clicking the keys. "I've said before (in my harsh, negative tone) that I don't quite get the appeal of watching some dude sit in front of a computer while too-loud music streams from the sound system. Or do I just need to relax and accept that this sort of thing is something other than a performance? Nonetheless, Deep Sea Invasion reliably conjures up tasty down-tempo electronica, slinging quirky, heavy beats and catchy melodies. "So what if it ain't like watching Beck dance in a stadium? But then, when the next group steps up, an actual band called Bon Reve, they unknowingly generate a bit of downer-cow synergy. By mercilessly slagging their missing singer (an Anton Newcombe wannabe, if that matters) then gamely plugging through some kind of generic psych-rock, their songs don't have much of a chance. 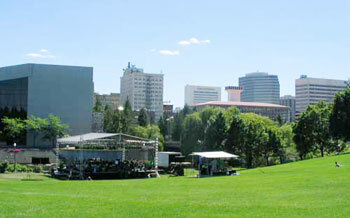 Land of the free: The Spokane Symphony plays, but where are the people? "They try to liven things up by having Deep Sea take the stage for a rollicking cover of Eno's 'Cindy Tells Me,' but the novelty and overpowering quality of the song seem to just further throw things out of balance. "Doc, I can't face it. I think I'm sinking in my own black attitude!" "That might be true, Kurt ... might be true. But chin up. Try again tomorrow. Besides, your hour's up."